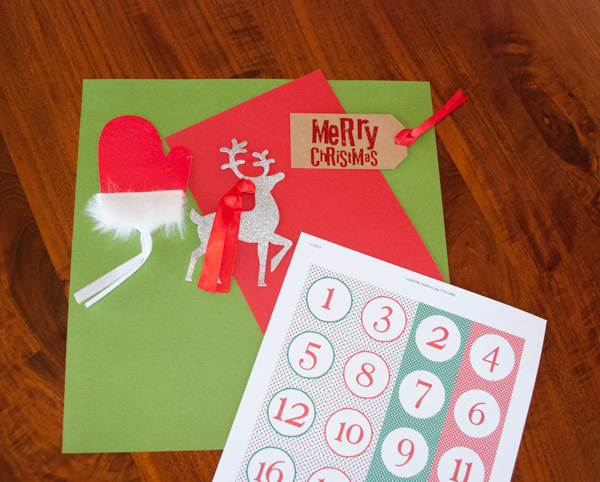 As the kids eagerly anticipate Christmas, make counting down the days a fun event for whole family. 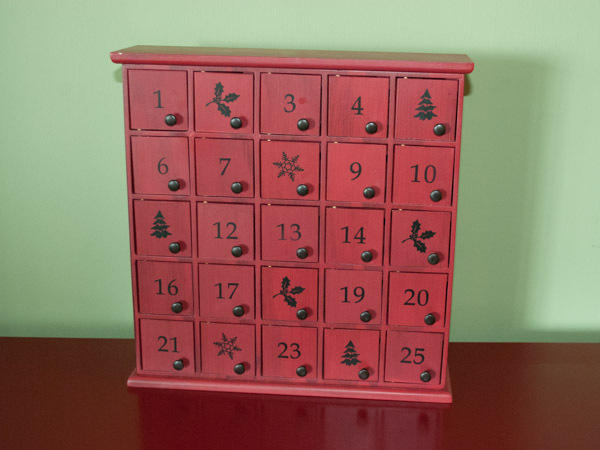 We have a little wooden advent calendar with 24 doors. I used to put a little treat or trinket behind each door for the kids to discover each morning. 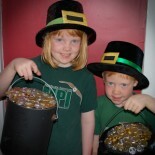 I noticed that they were disappointed if the treat was not chocolate, so we quickly changed tactics. The chocolate was replaced with small felt ornaments. One child gets to open the door on the even days, the other on the odd days. They hang the ornaments on a small artificial tree. 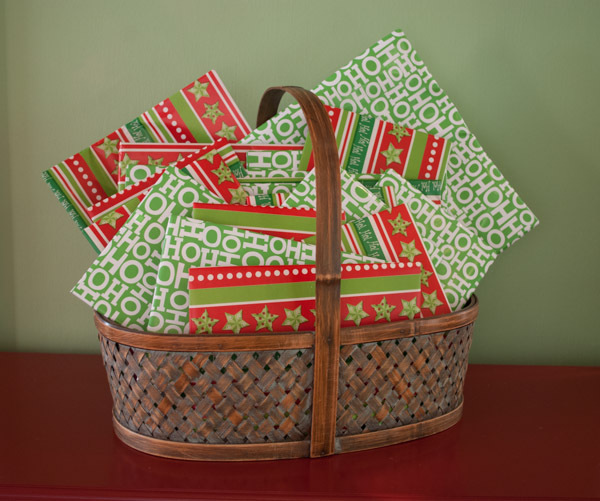 Wrap 24 holiday books and have the kids select one to unwrap each night for a bedtime story. Include old and new books. We store our Christmas books in January, then pull them out each December and place them in a basket near the tree. The kids love rereading them each year. Last year Kevin and I traveled during part of December. The nanny told us that nighttime would be the hardest for the kids, so we decided to wrap a book for each night. Based on the shape and size, they tried to guess which book it was. I added a few new ones, since I ordered a few inexpensive books from the kid’s school and socked them away. They enjoyed it so much they’ve asked to do it again this year. I found these picture frames a few years back. There is a spot in the center for a larger photo and 12 spots all around for smaller ones. I bought two and made little doors out of craft paper to cover each opening. I cut out images from old Christmas cards and glued them on the little doors. I printed the numbers one to 25 and used a hole punch to make the doorknobs. I made two 25 spots, so each child could open one on Christmas morning. I slipped little papers inside each window with an activity suggestion for each day. Some were as simple as having hot cocoa with breakfast. Others were more significant, such as watching the Hawaii Kai Boat Parade. There were times I just drew a candy cane and told them it was hidden in the kitchen. The beauty of this system is that you can make a quick switch the night before if you realize that won’t be able to do that activity. 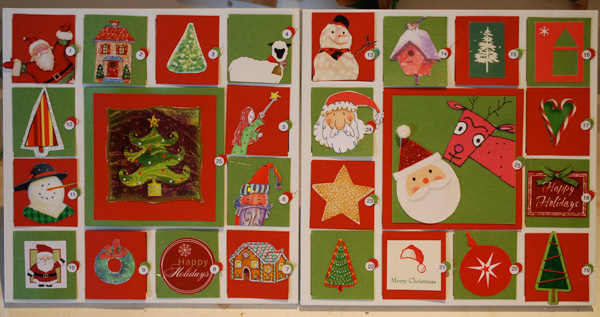 Want to Make your own Advent Calendar? This year the kids helped me come up with the activities. They no longer want to do some that they used to enjoy, such as riding the Candy Cane Train at Ala Moana Center, and have some new ideas, such as going to see the new movie Frozen. Homework and after school classes mean we can’t pull off all of the activities we did when they were younger. I found an Elf on the Shelf activity book at Costco. Elfontheshelf.com also has printable activities under the “teachers” tab. 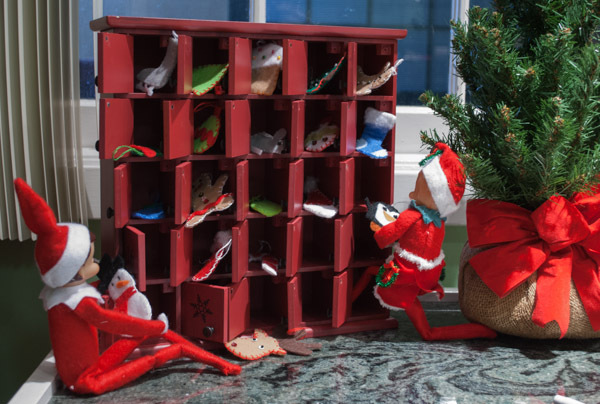 We are BIG fans of the Elf on the Shelf. 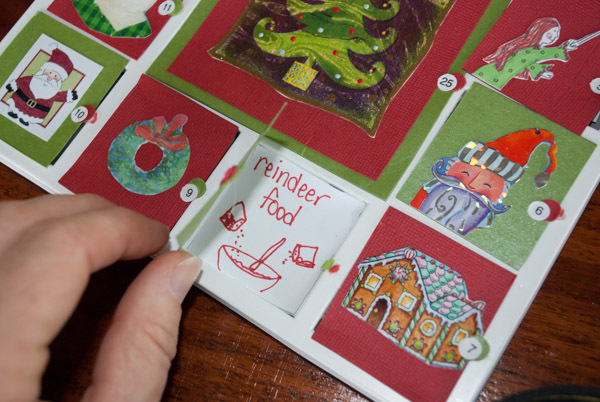 I will slip some of these pages into the advent calendar on the busy, scheduled days when we can’t fit an activity. 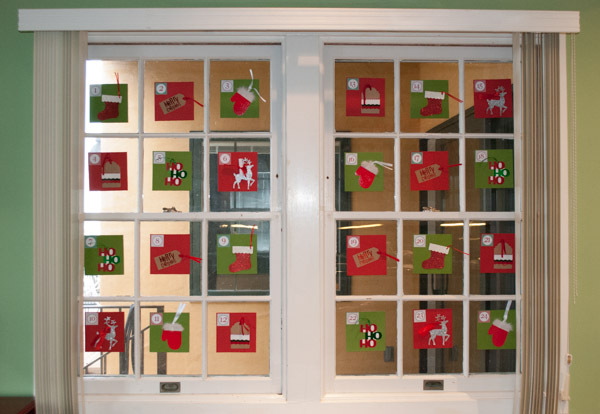 We have two double-hung windows in our kitchen that have 24 panes, where we will hang our calendar. You could also scale down the paper and use a 24-cup muffin tin or hang these squares as a bunting along a wall. Numbers one to 24. 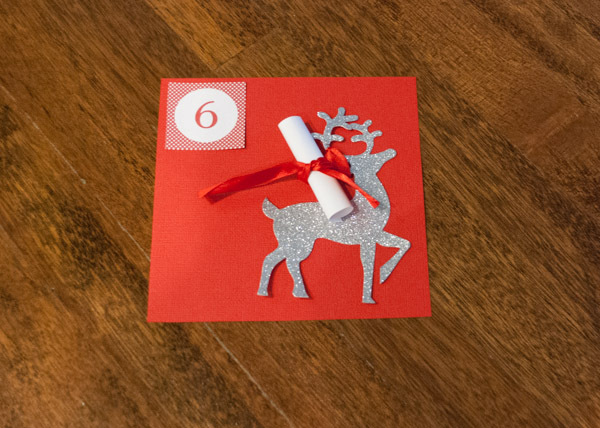 I printed numbers out from http://haathse.com/2011/11/25/friday-freebie-advent-calendar-number-printables/ and cut them out. 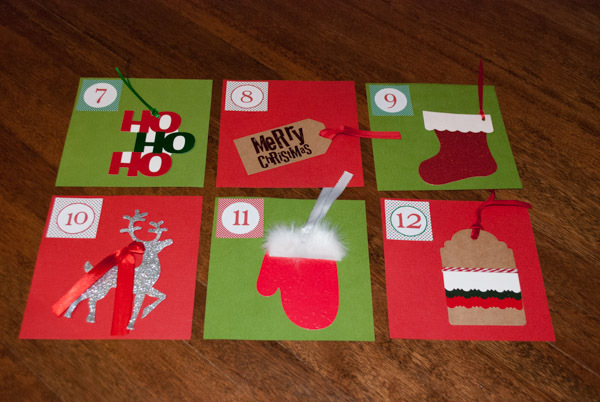 Lay the red and green squares out and attach a gift tag to each one. Attach a number to each card. Make a list of the activities you’d like to do in December and write each one on a slip of paper. Some activities will happen on specific days. Figure out which days those will occur and attach those first. For example, the Kaimuki Christmas Parade is Dec. 5, so that will be on the back of No. 5. Then fill in with other, more flexible activities. I rolled up the slip of paper and used the ribbon on the gift tags to hold the activity. You could also tape it on the back of the gift tag or the square of paper. 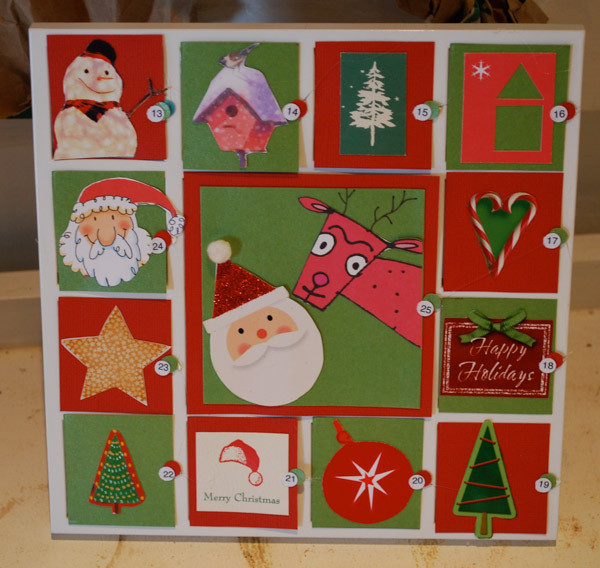 This entry was posted on November 30, 2013 by mdaucello in Christmas, Crafts, Crafts, Holidays and tagged advent, calendar, christmas, count down.